Below is a description of a number of holistic fertility treatments. An important note: Engaging advisers—whether they’re fertility doctors, or practitioners of fertility acupuncture or therapists—can be eminently useful as long as we don’t see them as anything more than our esteemed consultants. When we leave our Inner Fertility Authority out of the equation, when we do not participate fully in our own fertility treatment, we simply replace the experts at our fertility clinic with the experts in Chinatown. Thus we miss out on the most valuable source of guidance. In the Fertile Heart™ language we call that guidance the Ultimate Mom. Holistic fertility treatments are healing modalities that place equal value on all aspects of an individual (physical, intellectual, emotional and spiritual). They are based on a deep understanding of each person as a unique whole, which implies a treatment for the total person, not just for one part or organ. Holistic fertility treatments look at symptoms as a sign of the organism trying to heal, and offer fertility remedies that stimulate the body’s own healing mechanism. The most important factor in holistic fertility treatments is not which therapies we choose but how we choose them. We are the ones who need to understand what has to be done, because the changes takes place within our bodies, minds and souls. Instead of placing all authority and decision making outside of ourselves, we begin to reclaim the power to decide what does or doesn’t make sense, what is or isn’t possible for us. You may also find the Fertility Treatment Options CD to be a helpful resource. It includes presentations by a homeopath, an herbalist, a nutritionist and a cranio-sacral therapist. The Fertile Heart™ Ovum Practice is an independent healing modality that views a symptom as a an appeal of the body and heart to be heard. Carefully structured Fertile Heart Imagery and Body Truth movement sequences are used to identify the messages behind the symptoms. The Fertile Heart Practice can be used in conjunction with mainstream fertility treatment or any of the holistic fertility treatments listed below. It can also be used as a creativity enhancing spiritual practice. Addressing Fertility Difficulties through Homeopathy The basic system was devised and verified by Dr. Samuel Hahnemann, a German physician, nearly 200 years ago. The fertility treatment would be based primarily on symptoms verbalized by the patient after careful self-observation, as well as physical signs detected by the practitioners. A homeopath may also use laboratory tests to diagnose fertility related imbalances. The law underlying homeopathy is the law of similars: The substance that produces certain symptoms in a healthy person will cure those same symptoms in a sick person. Fertility Foods, Related Fertility Nutrition and Lifestyle Changes Diet is an important factor in shaping our health and the only major determinant of health that is completely under our control. Improving our diet and supplying our bodies with nutrient-rich whole (as opposed to processed) foods can often be an important step toward restoring balance in our bodies, and increasing our overall level of health. You may also refer to the fertility food-related chapters in The Fertile Female and in Inconceivable, and the fertility food articles on this site. Fertility Herbs Herbs can assist in correcting the underlying factors of disease and reverse some of the health-inhibiting conditions. Craniosacral Therapy The craniosacral system is a semi-closed hydraulic system that encloses the brain and spinal cord, and consequently has a powerful influence over a wide variety of bodily functions, the endocrine system, and the hormones that it secretes. The craniosacral therapist uses gentle massage and pressure to release blocks and restricted movement of the cerebrospinal fluid, which inhibit craniosacral system function. Healing Visualizations and Fertile Heart Imagery By repeatedly calling up images in your mind you rewire the circuits of your mind toward a realization of those images. The remarkable feature of imagery work is that it can be accompanied by physiological changes. 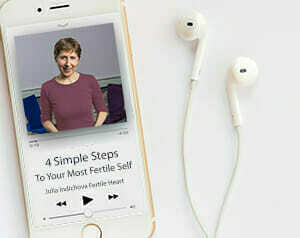 The Fertile Heart Imagery is a unique approach to using images to resolve inner conflicts about motherhood, fears of pregnancy or any other issues blocking conception. Fertility Acupuncture Currently the most commonly used form of holistic fertility treatments focuses on removing obstructions to the free flow of “qi” (energy) and repairing patterns of imbalance described as “damp heat” and “liver qui stagnation.” Most fertility acupuncturists suggest that a three month treatment should be sufficient in restoring hormone balance. “Does a holistic approach to fertility mean choosing acupuncture, or homeopathy, instead of in vitro fertilization? Or could it mean, as I and so many of my students have discovered, a choice between decisions based solely on statistics and other people’s opinions, and action based on everything we know and discover about ourselves. When faced with a diagnosis, or a life crisis, do we turn a deaf ear on all the helpless voices inside us calling out for help, or give each one the attention it deserves? Do we perpetually search for someone to fight our battles, or learn what it takes to become our own fiercest allies?” From The Fertile Female by Julia Indichova Copyright @ Fertile Heart™ 2010 No part of this document can be reproduced without the permission in writing of Fertile Heart™ and Julia Indichova.